Have you ever wanted to try something new but because it felt awkward you backed away from the change and went back to what felt more comfortable, even though part of you really wanted to persist with the change? I have been struggling with such a difficulty. When you look at that photo do you think – ‘There sits a credible executive coach and corporate facilitator?’ I didn’t think so! Although I don’t actually turn up to meetings with clients looking this dishevelled and dotty (really I don’t!). 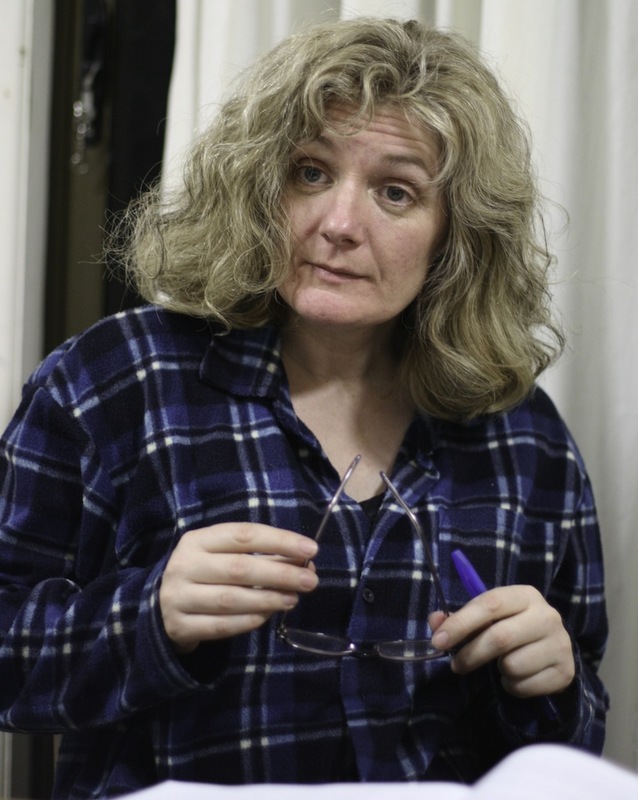 I do have wild hair and a tendency to present myself a bit like a kindly lady doctor (as this is what I was for many years!). However, I recently read this paper and also this one and realised that appearances do impact on whether others take us seriously. Then a dear friend, who is also a client, told me, ‘Rachel, one of the things I love about working with you is that you turn up to run a session and people don’t expect you to be so competent because you aren’t dressed in a sharp suit and you appear so unassuming and then you do amazing work and they are surprised‘. And I became concerned. I want my work to have a significant impact on others. I want to play a part in helping people to have more vitality and meaning in their work. I don’t want something as simple as my appearance to mean I am starting at a disadvantage with new clients. So I decided that I wanted to present myself in a way that is authentic but perhaps a little more skilful. Goffee and Jones call this: Be Yourself – More – with Skill. What does that look like for me? Probably not a sharp suit but perhaps a little tidier? 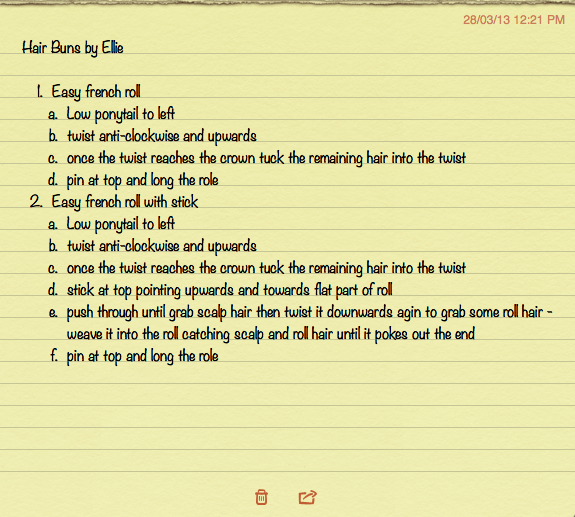 So I ask my lovely daughter, Ellie, to teach me how to put my hair in a bun. I have found this new skill very hard to learn. I feel clumsy and awkward. My mind kicks into action telling me, ‘Why are you wasting time learning something so silly when you could be learning something useful and important like Relational Frame Theory‘. The bun falls out halfway through the day and my mind says, ‘Told you this was ridiculous’. I start to wear a little more make up and my mind tells me ‘It is so superficial to focus on your appearance’ and ‘Everyone is judging you‘. I feel like a fraud. But part of me is excited about the possibility of who I could become. In the presence of these conflicting thoughts and feelings I remind myself that the best values and actions are freely chosen. It is okay for something as small as learning how to put my hair in a bun to matter to me. I ask Ellie to help me again..and again. I write down her instructions and follow them carefully. I am still rubbish at buns but I persist. One day I will be a lady who weaves beautiful buns, knots and french rolls. Hopefully, as a result, I will look a little less dotty and a little more competent and I will ‘be myself – more – with skill’. If you were to ‘be yourself – more – with skill’ what would be different about how the world experiences you? Is there a change that you want to make but it feels awkward?Would the change be a move towards your values? If so, are you willing to persist with the change and have the feelings of awkwardness? I am going to be the lady who both knows Relational Frame Theory and wears a beautiful bun. How about you? Who will you be? Over Christmas I put on an additional 3kg. I have been getting rid of it ever since and I have realised that losing weight is a fantastic practice in psychological flexibility. Just about every minute of the day there are opportunities to be mindful of bodily sensations associated with hunger or satiety, and each day there are dozens of opportunities to reconnect with why losing weight is important to me. This experience also got me thinking about why weight is such an enormous problem. Obesity rates doubled globally between 1980 and 2008. In 2008, the total annual cost of obesity in Australia, including health system costs, productivity declines and carers’ costs, was estimated at around $58 billion. In Australia 68% of men and 55% of women were overweight or obese in 2008. Part of the problem here is diminishing physical activity. The World Health Organisation reports “Globally, around 31% of adults aged 15 and over were insufficiently active in 2008 (men 28% and women 34%). Approximately 3.2 million deaths each year are attributable to insufficient physical activity.” Nobody wants to be obese but people are getting fatter, and everybody knows that they should exercise more than they do. Clearly there is a disconnect between intentions and actual behaviour. “… intentions account for a weighted average of only 30% of the variance in social behavior (Armitage & Conner, 2001; Hagger et al., 2002), mainly because people with strong intentions fail to act on them (Orbell & Sheeran, 1998).” (Chatzisarantis & Hagger, 2007). Why might this be the case? One reason people fail to act on strong intentions is because they simply forget to start the behaviour. Have you ever said something like “This week I will exercise three times” and then before you know it, the week is over and you haven’t exercised at all? This is why setting specific goals and thinking about contextual reminders is so important. In the literature, this sort of planning is called “implementation intentions”. But another reason why people fail to act on their intentions is because their responding has become habitual and automatic. When we don’t reflect on our moment to moment behaviour we are very likely to do what we have always done in the past. From one point of view, this might be a bit of a problem for the ACT model. If our behaviour is relatively independent of our intentions, then what is the point on getting clear on our values when we might just act out of our habits and unreflected impulses anyway? This is where mindfulness becomes really important. Values clarification on its own is of little use unless we bring awareness to what we are doing and we have the self-regulatory skills to enact new behaviours. But is there any evidence that mindfulness can help us do what we want to do? Chatzisarantis and Hagger (2007) explored how mindfulness affects the relationship between people’s intentions to engage in vigorous physical exercise and their actual behaviour. Why does mindfulness help us act on our intentions? The authors then went on to explore reasons why mindfulness might strengthen the relationship between behaviours and intentions. Before we go any further, what do you think? Why might mindfulness increase the tendency to act on intentions? Perhaps mindfulness increases awareness of goals in each moment and therefore reduces the tendency to forget what we said we would do. Or perhaps mindfulness improves our self-regulatory skills so that we are more likely to be able to manage the difficult emotions that arise when we do something new or challenging. 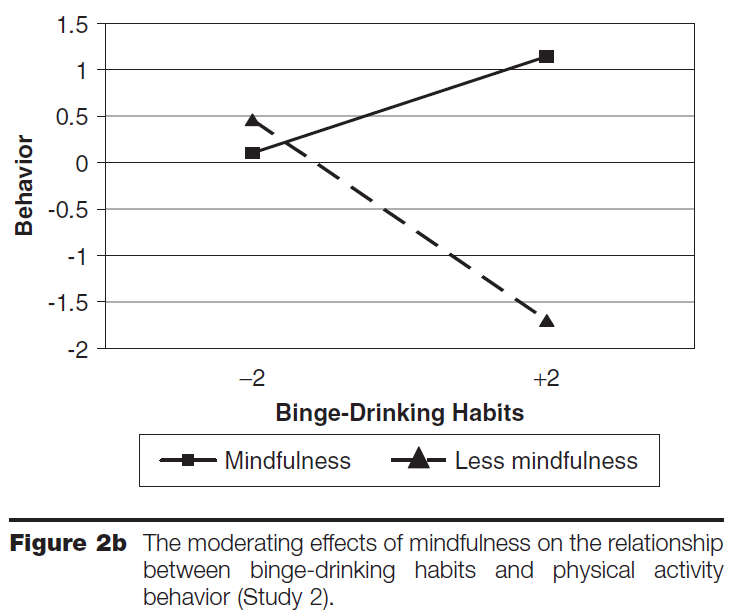 Chatzisarantis and Hagger (2007) tested a third possibility, that mindfulness helps us control counter-intentional behaviours, in this case binge drinking. They reasoned that binge-drinking probably interferes with doing vigorous physical activity (is it just me or do you too have an image of lying on a couch with a pillow over your head? ), and that mindfulness might reduce the extent to which habitual binge-drinking interferes with intentions to exercise. So maybe next Christmas I will be better at mindfully saying no to that Christmas pudding! So here we are in 2013. What will it take for you to define this year as successful? Let’s start by looking back on 2012. What did you achieve? What mistakes did you make? Where do you feel you failed? Did you get a promotion or an increase in salary? Did you buy something important like a house or a car? Did you fail to get elected to serve as President of the USA? It can be easy to focus on these external markers of success or failure. But what about your internal yard stick? How much were you the person you want to be? How often were you mindful or generous or brave or loving or …(insert your own values here). How good were you at noticing the times when you weren’t living your values and then gently adjusting your behaviour so it aligned more closely with who you want to be? Measuring your life by what you achieve isn’t wrong but the research suggests that we over estimate the impact of these events. We think that if we get the good job and nice house we will be happy and so we conscientiously pursue those goals. Sometimes we are so busy striving that we neglect other important aspects of our life, like nurturing our health and our relationships, and we forget who we are and what we want to stand for. The second way of measuring your life – Did I live my values? Was I the person I want to be? – is both more likely to create richness and meaning and will tend to support you in making those moment to moment choices that determine the direction of your life. So as you review 2012 and before you set yourself some goals for 2013, spend a few moments revisiting your values. Lundgren’s Bull’s Eye activity is a cool way of doing this. I am so excited to be joining “Working with ACT” exactly two years to the day since Rob and Rachel started this wonderful blog. Working with mindfulness and values is a big part of my professional and personal life. My aim is to bring you interesting perspectives on ACT research. By way of introduction, I thought I might briefly review one of my own papers written with Sharon Parker. I promise I will focus on papers by other people in the future 🙂 Here is the citation from which you can link to the paper if you would like to read more. Atkins, P. W. B., & Parker, S. K. (2012). Understanding individual compassion in organizations: the role of appraisals and psychological flexibility. Academy of Management Review, 37(3). “I don’t do emotions!” This was a comment made by one of my students in reaction to an exercise exploring values and stressors at work. But in reality, we all “do emotions”. A growing body of evidence clearly shows that emotions are a major determinant of performance in all workplaces, including public sector organisations. Emotions alert us to what matters, they allow us to communicate and make decisions that are effective. Emotions are at the heart of thinking about how we wish to live and what we wish to create in society? Becoming skilful at recognising and influencing emotions at work is a key facet of effective leadership and management. Such skill rests upon the quality of our awareness and perspective taking ability. We need to be able to take the perspective of others to act effectively. We need to be compassionate if we are to respond skilfully to our own and others emotions. Compassion towards oneself and others is a critical part of building effective relationships and making good decisions at work. Think for example of how you handle situations where you or someone in your team fails to achieve important goals. What would it be like if people were more compassionate towards themselves and others at these times? There are three judgments that can get in the way of compassion towards self or others. First, we can fail to be compassionate because we judge that the person who is suffering is not deserving of our compassion. For example, we might judge that the person brought their suffering on themselves. Second, we might judge that the person’s suffering is not relevant to us. Research shows we are much less likely to extend suffering to others who have different goals, or belong to groups with which we do not identify. If we make this judgment, we are more likely to feel disconnection rather than compassion. One can easily see how this judgment is involved in the debate over immigration in this country. Third, we make a judgment about our personal resources. If we don’t feel as though we can cope with being in the presence of another who is suffering in some way, we are more likely to feel distress rather than compassion. The manager who cannot bear to be in the presence of a person crying is making this sort of judgment. This judgment appears to be involved in the experience of burnout many people feel when they work in jobs that involve caring for others. Of course, these judgments are sometimes justified. Modern evolutionary theory suggests that such judgments are an important aspect of self-protection and effective group function. Sometimes it is best not to feel compassion, or at least not to act upon it. Our argument is not that we should always feel more compassion. Our argument is that it is helpful to become more aware of the automatic reactions that drive our behaviour. To the extent that we can catch our reactions in motion, we can choose our responses more deliberately and improve our effectiveness. So how might we learn to catch our automatic reactions, and act more in line with what really matters? If you have been following this blog you will know that there are two aspects of effective training in emotional skills. First, we need to increase mindfulness. Being mindful means being aware of what is happening in each moment both within ourselves and in the world and bringing an attitude of openness to that experience. Second, we need to be clear about our values and the values of the organisation in which we work. There is no point developing awareness if we don’t know how we want to act in the world. Values act as a compass to guide our behaviour. What has been your experience of compassion at work? Is it encouraged? Does it have a positive impact? Do you have something important that you need to do but even the thought of it makes you feel so uncomfortable that you just avoid it? It might be risking rejection; doing something boring; risking looking stupid….. In this great podcast, DJ Moran talks about slicing these challenges up really thinly. Finding the point where you have made it small enough that you will take action. 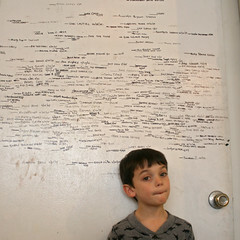 He uses the metaphor of jumping off a piece of paper. Even though the jump is really, really tiny; you are still jumping and that is very different to not jumping at all. And once you have gotten moving, you might tackle jumping off the phone book next! When you have to make a difficult decision (Shall I eat another chocolate almond? Shall I buy the $15 wine or the $50? Should I apply for that job?) considering how you would view that decision in 10 years time leads to wiser decision-making. Daniel Goldstein explains how to better connect to the future you in this TED talk. Yesterday I spent the afternoon at the ANZ ACT conference with an extraordinary group of ACT practitioners who, like Rob and I, are committed to using best practice to create workplaces where people find meaning and purpose in their work. The session was wonderful – although I did keep having the thought that it would have been even better if Rob had been there with me! The session was a reprise of a session that Rob and I delivered at Parma – a detailed handout for that session is here.